Whenever thrash metal is recognized by the mainstream world, we rejoice! Testament vocalist Chuck Billy was not only recently acknowledged, but celebrated by Jim Frazier of the California State Assembly for the positive influence he has made in the Native American community and the general public. 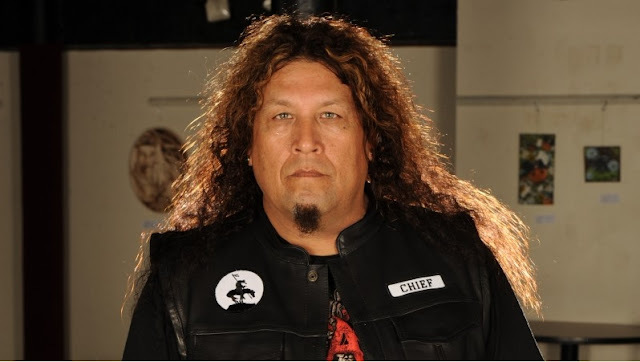 Chuck Billy is proud of his Native American heritage, with songs such as ‘Trail of Tears,’ ‘Allegiance’ and ‘Native Blood’ written by Billy in honor of his ancestral heritage. Billy is a descendant of the Pomo Native American tribe and the singer actually spent much of his youth on the Hopeland Indian Reservation just north of San Francisco. “The world of music is inhabited by creative and talented individuals whose work enhances the quality of life for all who are fortunate enough to have entered their sphere of influence,” says Jim Frazier. Testament’s 2012 music video for ‘Native Blood’ actually earned them a Video of the Year award at the Native American Film Festival. Billy was also recognized by the Smithsonian’s American Indian’s exhibit and was given the distinction of being the first Native American entertainer to be permanently featured in the memorabilia display of the Hard Rock Hotel in Albuquerque, N.M.
Testament’s ‘Dark Roots of Earth’ was met with critical acclaim in 2012 and set Nuclear Blast’s record for highest first week album sales, coming in with just under 21,000 copies sold. Responses to "Testament’s Chuck Billy Honored by California State for Positive Native American Influence"
I am curious to learn what Chuck Billy thinks of Hopland tribe's disenrollment of 74 members of his own family. Another Anonymous trollbot? keep the people divided. trump playbook 101. Everyone from the Rez who does good things always has haters... Every family has dirt and skeletons in their closet. But that doesn’t take anything away or have anything to do with the good path that Chuck lives. He’s a great inspiration for native people. One of my personal idols growing up.